UBCUK - UBCUK is delighted to have won the prestigious BCA ‘Group Business Centre of the Year Award 2017’ for its Cirencester Business Centre in Gloucestershire. 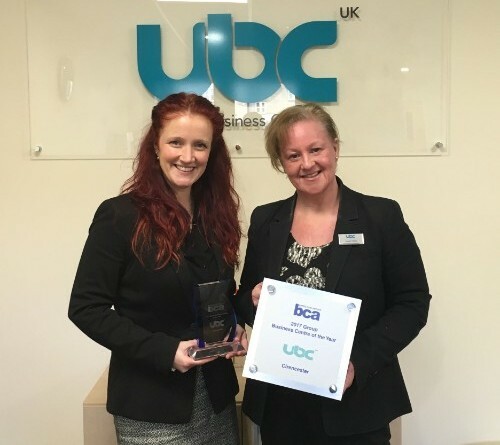 Midlands-based UBCUK is delighted to have won the prestigious BCA ‘Group Business Centre of the Year Award 2017’ for its Cirencester Business Centre in Gloucestershire. The announcement was made at the Business Centre Association (BCA) Industry Awards Gala Dinner, which took place on Friday 24th November 2017 at Sheraton Grand London Park Lane hotel. The BCA awards are based exclusively on client nominations and are judged on how well the centre adds value and supports clients’ businesses. Managed by Jenna Paynter and Alison Poole, UBC’s Cirencester Business Centre received glowing testimonials from every client in the building. In addition to Cirencester, UBCUK is delighted to have entered three other business centres for the award -- Birmingham Business Park, Henley-in-Arden and Birchwood -- each of which also achieved a 100% positive return of client testimonials. UBCUK has been providing flexible serviced offices to small businesses, independent professionals and corporate teams since 2007. Headquartered at Birmingham Business Park near Solihull in the West Midlands, UBCUK currently operates 8 business centres around the UK.